Fake iPod Shuffle and Domain Certificates - moot! What do these two products have in common? Aspects of awesomeness. 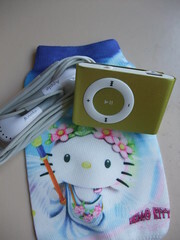 I recently purchased a 2GB "mini clip" MP3 player from eBay. The photos on eBay make it pretty obvious that they have copied the design of the iPod Shuffle, and technology wise there really isn't much that couldn't be easily replicated by any Chinese tech factory. So I took a punt, paid my AU$16.40 and within a week had my new toy in hand. I've listened to a few songs and an hour of podcasts through it and so far so good. For a week's worth of coffee, or two regular lunches by Sydney prices, I have an MP3 player I can jog with (and keep in mind a chunk of the cost went into the postage from Hong Kong). Its less than a quarter of the price of the iPod Shuffle with, as far as I can tell, the same functionality. Best of all, I scored a free Hello Kitty bag. That makes this totally awesome. Now to MelbourneIT's new* Domain Certificates. At first look it seems like the most ridiculous product idea, completely devoid of any function. However it has elements of total awesomeness when you look at it from the vendor's perspective. I would presume that most reactions would fall into two categories. Group A, the clueless (and hopefully the minority), will lap it up and happily display their shiny new Domain Certificate at their place of business. Group B, where I stand, will heap scorn upon it but send the link on to their friends for group mockage -- that's certainly how I came upon this. So from MelbourneIT's perspective its awesome. Group A are going to buy this crazy product at presumably insane profit margins, and Group B are going to provide free marketing. Its like the perfect product. This page contains a single entry by goosmurf published on May 27, 2009 2:40 PM. Slightly Good Luck was the previous entry in this blog. Subscription: The Future of Entertainment is the next entry in this blog.